Not far into the first act of Goosebumps, I realized that this was a film made for an audience much younger than myself—now at 29. While that might sound like a bad thing, it’s not at all. The “Goosebumps” series was created by author R.L. Stein in 1992, making it prevalent throughout much of my grade-school career. 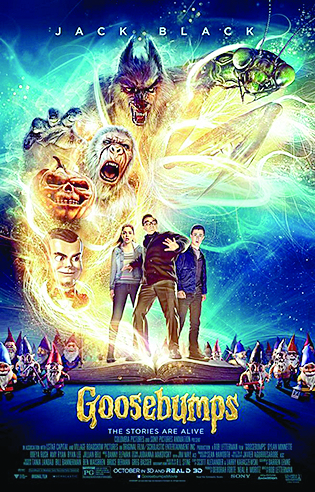 It would make sense for the target audience of a Goosebumps movie to be an older set, but, as someone who worshiped those books, I’m happy to see the series gifted to a new, younger generation. Director Rob Letterman turns the average book adaptation on its ear by casting Jack Black as R.L. Stein. The Stein in this movie is a keeper of monsters, a writer whose own creations came to life and now stay locked away in their original manuscripts, in Stein’s library. Through a series of mishaps, Stein’s new neighbor (played by Dylan Minnette) stumbles upon the manuscripts with his pal Champ (Ryan Lee) and the boys accidentally unleash Stein’s creations upon their town. Both young men, along with Stein’s daughter (Odeyah Rush), are forced to team up with the author to capture the creatures before it’s too late. It’s a fast-paced film with a few great set pieces and monsters galore; think of it as a horror-tinged Jumanji. I found myself delighted at all of the “Goosebumps” characters I recognized, frame after frame. Anyone who grew up with “Goosebumps” books will be suddenly reminded of all the wonderful characters that filled those pages and adorned their notoriously colorful covers. Goosebumps excels in providing a little something for everyone, across a wide age range. There are just enough scares to keep the little ones spooked, and it’s paired with enough humor to keep the older ones laughing. 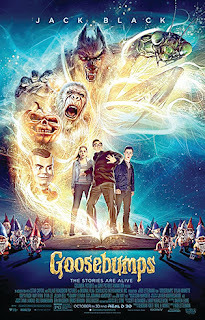 With a runtime short of two hours, Goosebumps is a lean and entertaining thrill ride that has enough heart and charm to earn the price of admission. Every child should have an introduction to horror, and Goosebumps is the safest—and most ideal—way to achieve that.